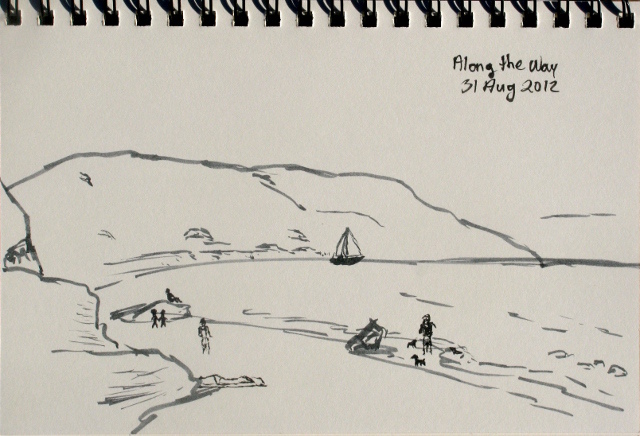 Sketches from the wild places of August treks. Chips Fire smoke from near the previous location of a fire lookout on Spanish Peak. A few of the lakes from along the Granite Gap trail. 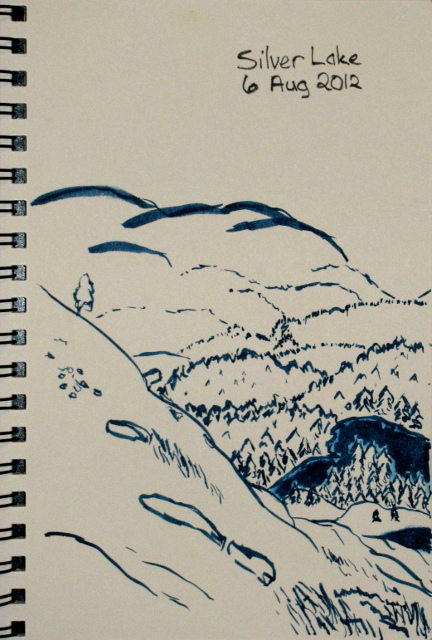 It may be heavy, but the big sketchbook ended up going with me backpacking. The watercolor book only has four pages left. At least the water brushes filled with ink are light. 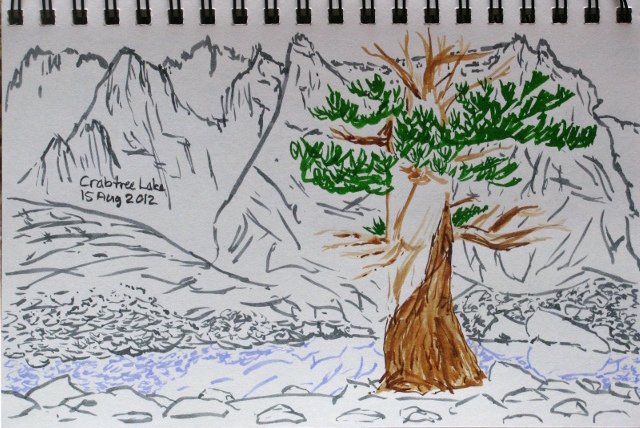 The last lake with trees on the first day backpacking. Neighbors fishing across the lake on the second day of backpacking. Found a tree above the treeline on the third day of backpacking. The trees near the treeline all have stories to tell as this one along the Crabtree Lakes. The meadow by our camping spot on the fifth and sixth day of backpacking. The lake we sort of planned to camp by on the fifth day of backpacking, but only passed on the seventh day. 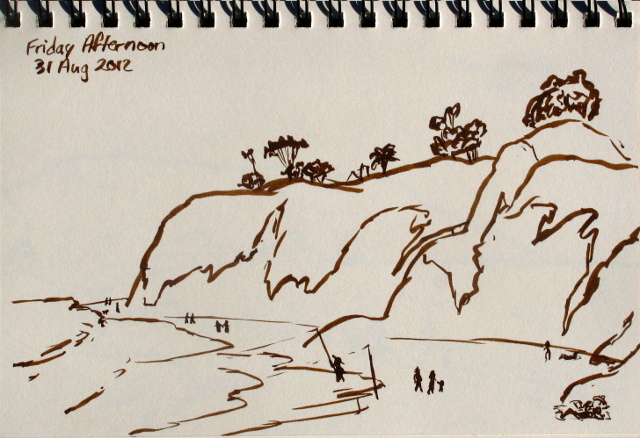 And some pictures from heading to the beach for good measure. This is the final part of a nine day backpacking trip that starts here. The sun starts to come up and we get up for an early start. We were thinking we might meet the other two of our group, back from Sky-Blue Lake, at Soldier Lake, but it as it is so near, they had gone on for more adventures. 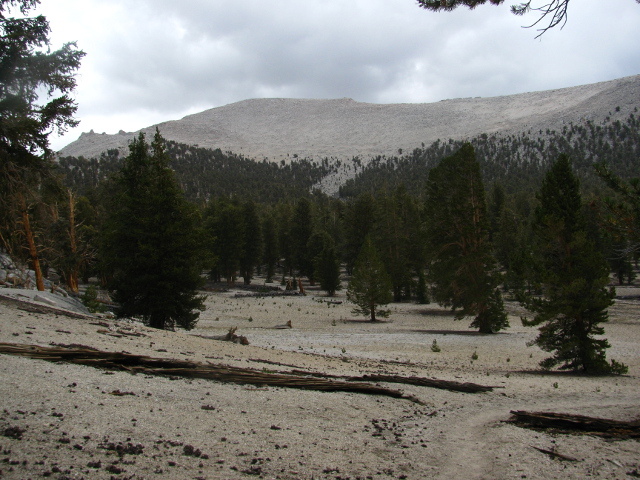 The secondary meet point is the trail head at 2 PM which is still 10-12 miles off, depending on our choice of route. I'm not too set on the importance of getting down by 2, but I suspect 3 PM is a good target to leave enough time to return my bear canister, so I'm running a little more slowly. 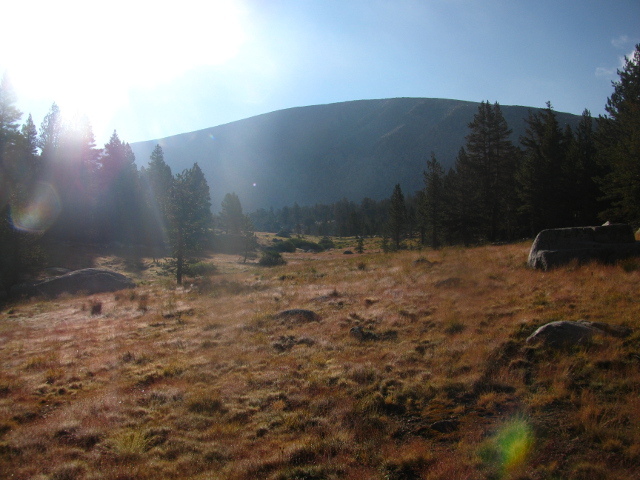 We all get out before the sun hits our campsite and head up the trail we came in on, going toward Cottonwood Pass. Near the junction between the Army passes and Siberian Pass, the trees are already thinning out again. We turn off our inbound route again quickly, taking the route marked Siberian Pass. Crossing the creek that comes down Army Pass, we head down a good trail into the trees along the creek, but quickly realize, especially with the help of the campers taking down their tents there, that this is not the route. We head back near the creek and head up a wide and washed out trail section, quickly coming to more good trail. This trail climbs up to give a good view of the Siberian Outpost as it goes to meet the Pacific Crest Trail again. 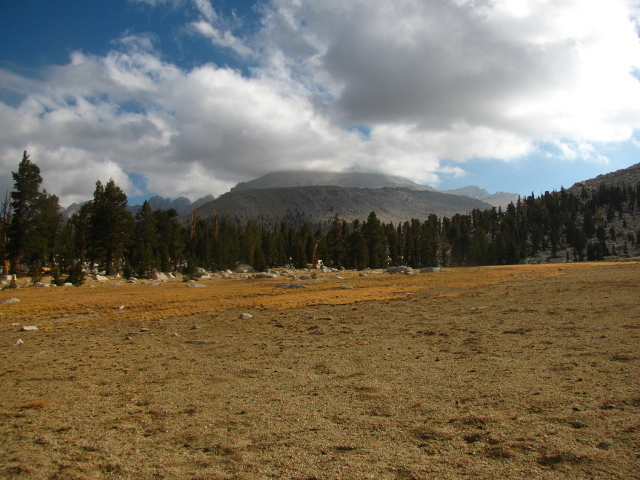 A large meadow on the way leaves space for views. This is part of a nine day backpacking trip that starts here. Clouds have moved in again for the morning as it dawns. There isn't much sun to enjoy, but we make the most of it. I feel already worried about the rain we may be getting for today. The sky seems to say, "Not yet, but soon." We find our way down to the south going trail and start to climb, quickly coming to a stock gate among the rocks. 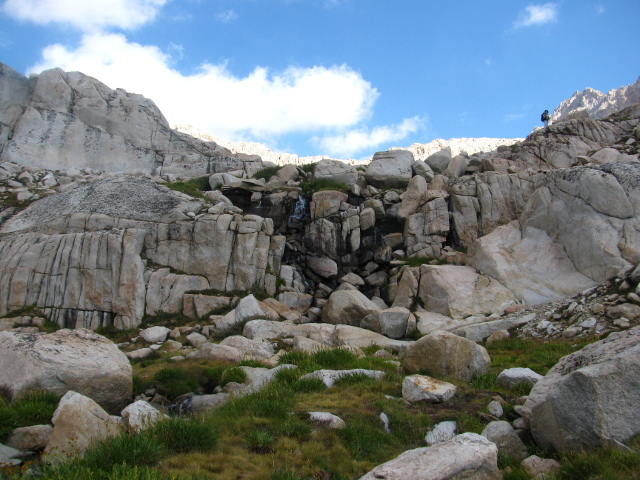 We make our way up, along the flat, and over a short pass to drop down into Rock Creek. 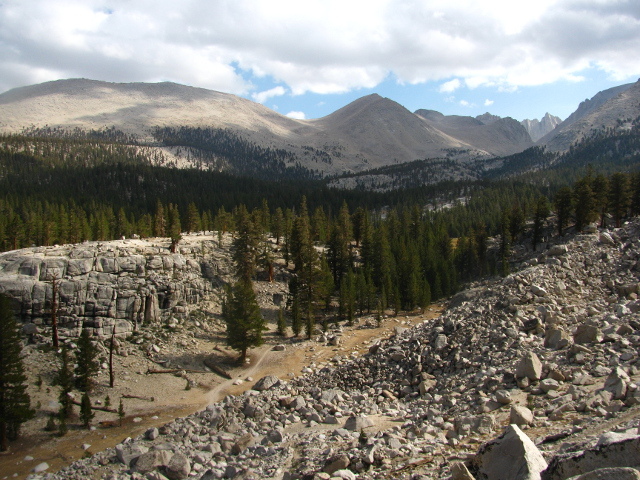 Looking back over Crabtree Meadow as we climb up into the rocks. Guyot Flat, which seems like an easy land except that it is so high up. I wake up to find that my play for sunshine in the morning is ineffective. The brightening sky is covered in clouds, particularly where it is brightest. I get a little bit of sunshine, but only for a few minutes. 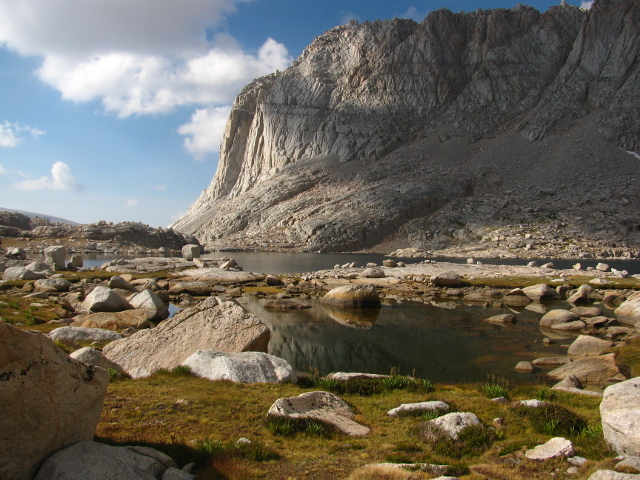 We have our various breakfasts and head out across country to rejoin the Pacific Crest Trail using three spots where the rock juts out from the cliffs on the south as a guide to our route, dropping only a little way as we go. We are aiming first for a large lake in the next drainage over. 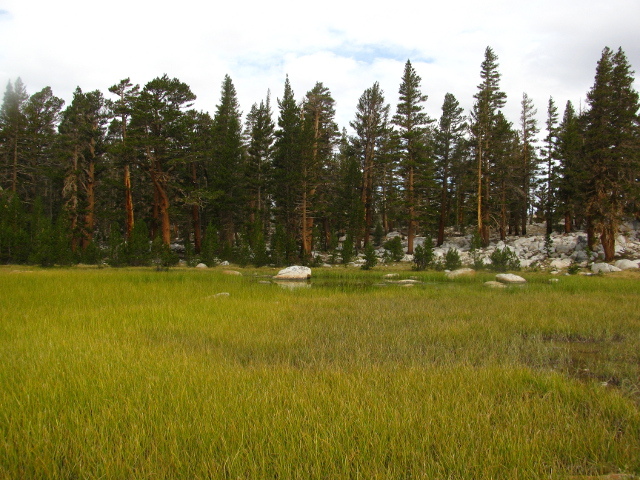 We come to the higher drainage and make our way past a few small ponds. Another meadow along the drainage that carries a deep puddle of water. It seems to be a lovely day again, somewhere through the trees, as the sun comes up. It takes a very long time to hit us while locations across the creek where the passing ranger had indicated there are more spaces got the sun long before we did. I pack up my stuff thinking it'll be nicer to stay up at Wallace Lake where, presumably, there are three more people, but the others only plan on a day hike. We continue up the use trail, sometimes losing it but always finding it again. The rolling granite slopes of a wide glacial valley. A pond along one of the tributaries to the south of our route. The new day dawns nice and sunny. Only the very smallest dots of clouds are in the sky to cause any worry about weather later in the day. Reports that our missing group member had set up at the end of the lake turn out to be true. Our old neighbors turn up again, one with a pack and the other two without as one is hiking out over Whitney by trails while the other two stay for more off-trail adventures. We set out our stuff to dry, then pack it up more carefully for protection from water. I leave my sleeping bag in the bivy as it is stuffed. The good dry bag being used to hold lunch gets the clothing in it instead and a smaller sack is used for the lunch food. Really, a simple arrangement to keep dry the things that it is most important to keep dry. We head out, down the trail that comes up to the lake. The lower Crabtree Lake from the outlet end at the west. 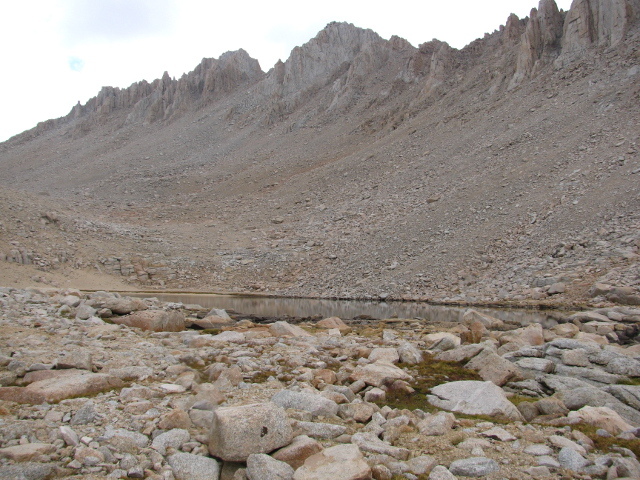 At the bottom of the lake, the trail passes over scree, progressing diagonally downward making it hard to see where it comes out. Others have made a smaller trail crossing over the outflow. Experimentation showed that both routes work to get back onto the main trail down. 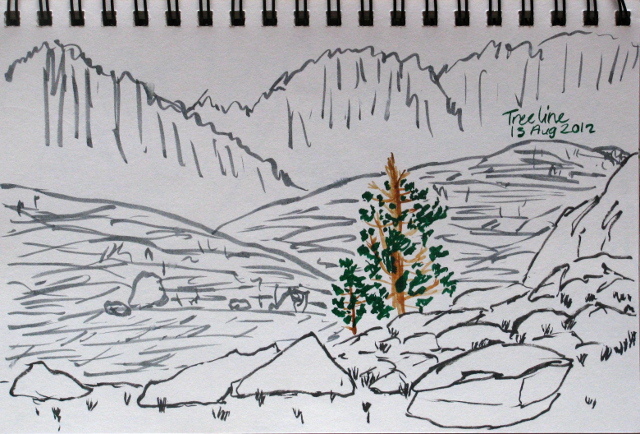 The mountains out by the Kern River, far to the west. The day dawns with beautiful skies. Puffy clouds play their way over the sky. The optimist can claim that there will be no rain today, but the realist suspects that these clouds will have friends soon and together they'll all have a party later. I untie my line and set everything out to dry again. The wet sleeping bag hood wasn't too horrible in my synthetic bag, especially while wearing my wool hat that ties on. 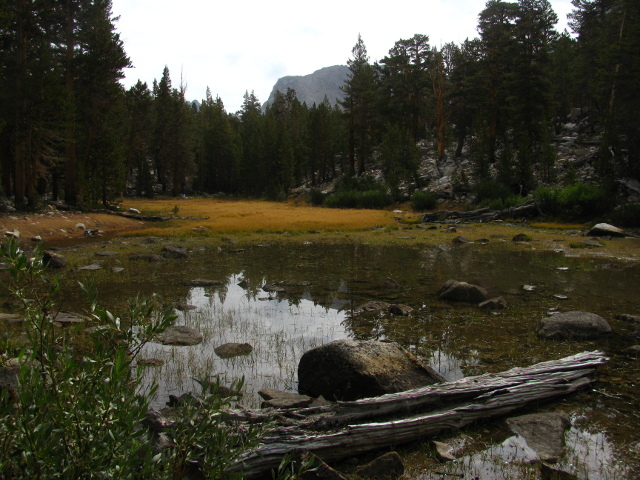 Today, we go over Crabtree Pass and down to one of the Crabtree Lakes where we will have trail again. Poking around the day before determined that the direct route up wasn't very accessible, so we plan on making a lazy loop to the left and back around to the higher large lake instead of climbing the outflow. Our neighbors, a group of three hidden around a bump of land, headed out before us with a more direct plan for the upper lake just over the pass. 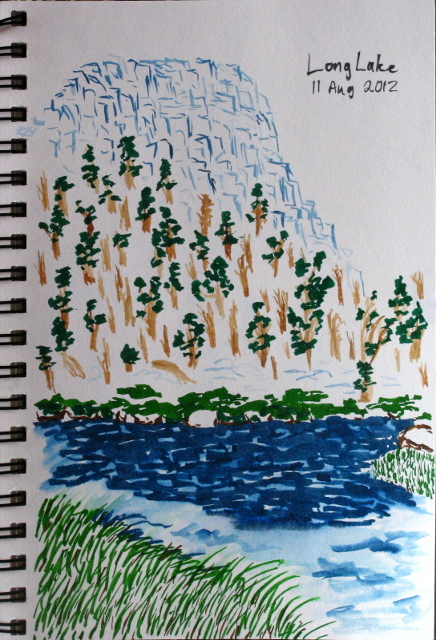 Circling around Sky-Blue Lake and the couple of ponds around it to head up Crabtree Pass. 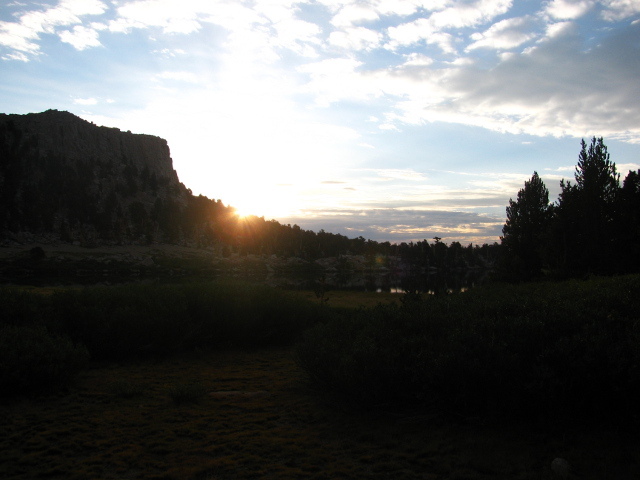 We circled around the lake on the east side, which is fairly flat and has many shallow ponds and avoids a few cliffs on the west side, to come to the waterfall that flows into Sky-Blue Lake. Some went up one side and some up the other, but none had much trouble finding a route. From there, we left the stream and headed to some small lakes to the west, finding another stream feeding it all there too. Climbing up the waterfall to see what comes next. As it turns out, more cascade. The day dawns sunny but with clouds again as I get up. Most aren't moving until the sun hits them again, and I was happy to follow suit. When it does, I untie a few knots and push my makeshift roof aside to let it dry a little and started putting other things out as well. The day was quite cold without the sun on me, but with the sun it warms quickly to something very pleasant. I pull my camera out of the bivy's waterproof stuff sack to find that I should have made sure it was drier when I put it in. There is now moisture on the inside of the LCD and it turns right back off when I try it. Today is a layover day and we are entertaining thoughts of going up one of the peaks although we don't know any of the routes. 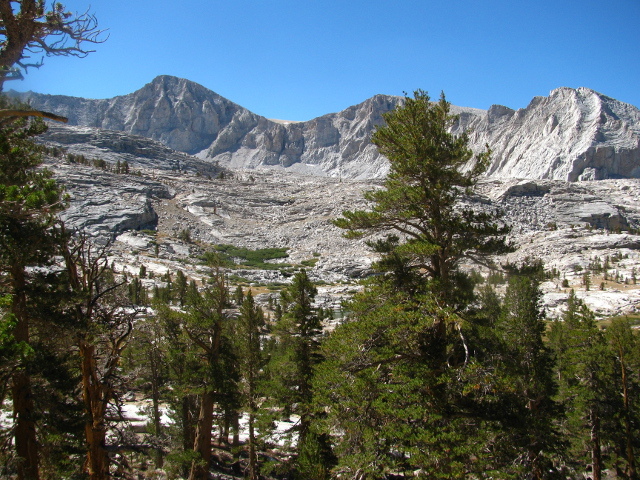 First, we'll go up to Arc Pass for a good look at Whitney. I tuck the camera into the mesh side pocket on the sunny side of my pack with the LCD out as I leave, hoping a little drying is all it needs to be more cooperative. Halfway through climbing up to the lake that is about halfway to the pass, I decide that our route finder for today has a tendency to go up routes that are harder than I really want to go up even when there are plenty of other routes. I decide to head off to the left of the lake's outflow for what looks, to me, to be a better way, and find a use trail heading up to the lake. From below, it looks like my route will have some extra climbing and those below say so, but I figure it will be worth it for the easier route. Getting to the top, I end up following some more outflow as I crest the side of the lake on the low side after all. Trying my camera, I find it is willing to work again. One lake on the route to Arc Pass. Beyond it, the perfect arc of the drainage heads up to the perfect arc of the pass. 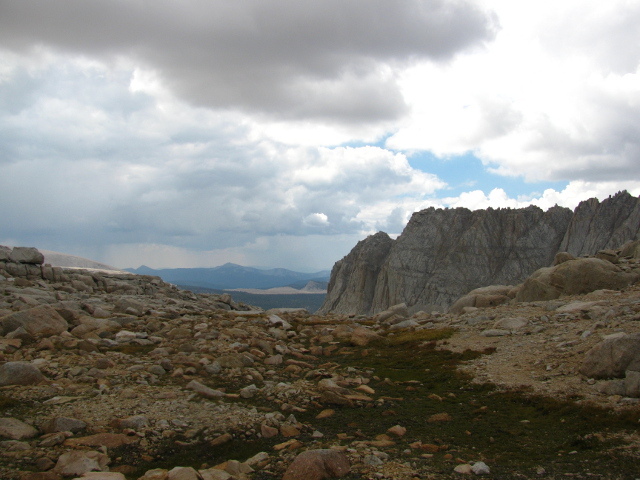 The clouds are already gathering as we climb up to Arc Pass. The sky seems to get a little bit brighter all through the early morning hours with a planet or two, one quite large and bright, rising followed by a sliver of moon. Finally the brightening seems to really get going and the day dawns with a few clouds but plenty of sunshine to be found to dry out the wet stuff. I reach out to untie two knots holding the roof up and fold it aside and out of my way of getting up. My sleeping bag feels wet in the bottom where the bivy sack pocked out from under my makeshift roof that I was really only trying to put over the top half of me and give me some room to store boots and rain gear. I worry for a moment that it has not held, but inspection shows no moisture, only cold. My sockless feet weren't happy about it, so I decide to wear my thinner socks of the two pair I'm wearing to hike in. Of course, I'd already decided that on going to bed, that's how they got wet in the night. The rain has long gone by the time the sun rises, but there are plenty of clouds left in the sky. The group makes an easy morning of it, generally getting up when the sun actually hits a tent. The Meet-up group camped around us have taken off in the early hours to go up Langley. Their tents have been left for when they come back in the afternoon to pack everything up and head out again as they are only here for the weekend. I set everything out to dry and have breakfast, then get it packed away and on the trail again, heading up New Army Pass. Today, the destination is Sky-Blue Lake, a large spot of blue off the beaten path. 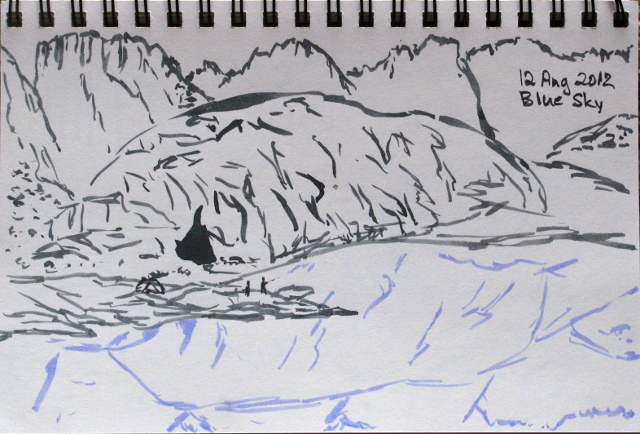 First, we have to find High Lake, which turns out to be a fair ways further up the rocks. The trees do, indeed, stop before we get there. 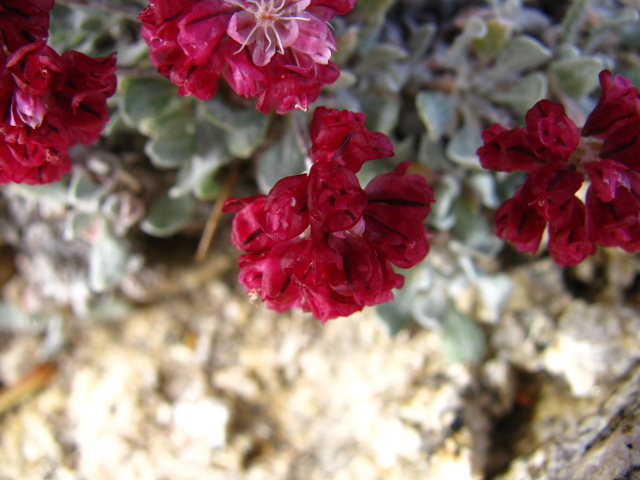 These red oddities caught my eye as I climbed into the high alpine areas. 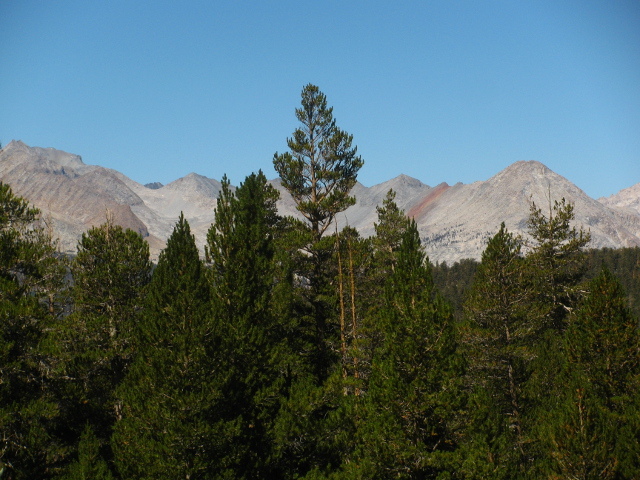 I have a chance to go into the high Sierras for a bit over a week, and although I'm feeling a mite irresponsible to take it, well, I have a chance to go into the Sierras for a bit over a week. 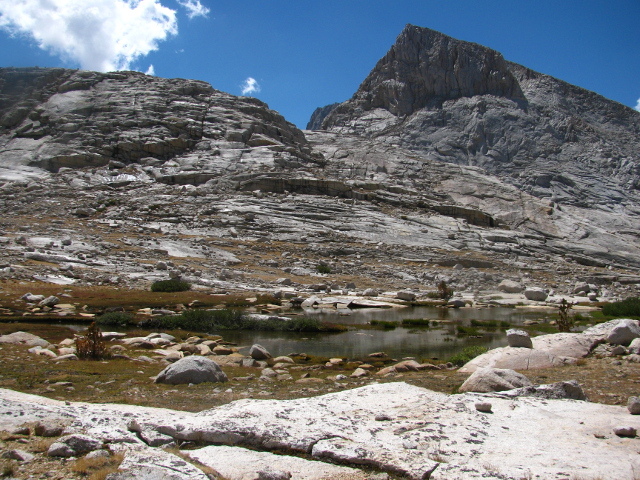 The trip is set for nine days and goes from Horseshoe Meadows around the back of Whitney to Wallace Lake by a route including cross country sections. 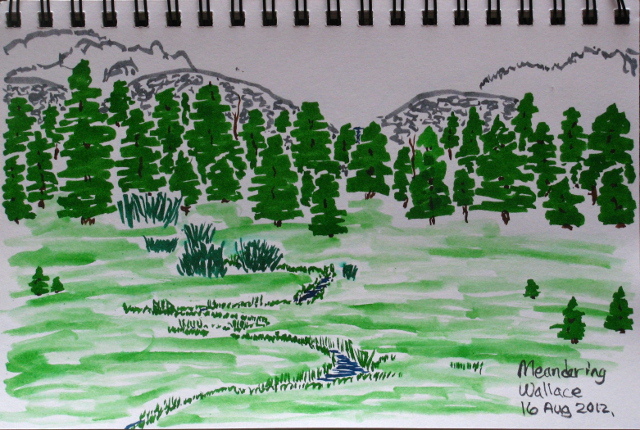 The original plan continued out via Shepherds Pass, but there was some mumbling about that particular pass, so it was decided to return to the Meadow by the trails to make a loop out of it and forgo the car shuttle. Permits to go into the "Whitney zone" were long gone when the permit was reserved, so Hitchcock Lakes and the mountain were out for legal reasons, but I went there back when we didn't need anything more than to fit into the quota of some trail head and the resources to hike from there to the mountain. 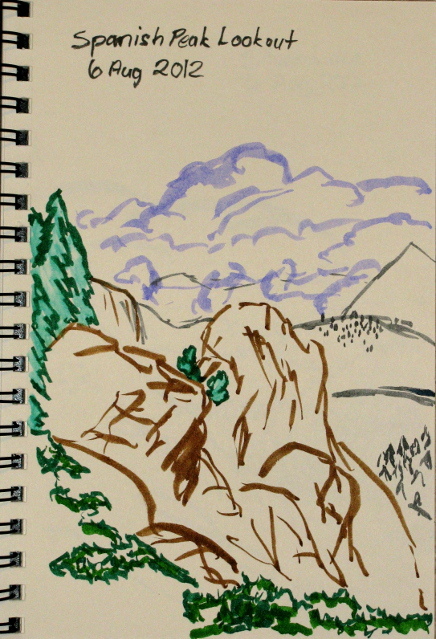 I've been to the top twice, and though they were both half my life ago, I don't really feel much need to go again, yet. I'm battling the heavies with some of my rather old stuff, so on the way down from the Lassen area, I stopped in Reno for some shopping. REI didn't have the bear barrel I wanted (the Bear Vault in large size so I have the best chance of getting nine days of food inside and with slightly fewer ounces) nor the light bivy sack I felt like trying. I should have gone ahead and picked up one of the Garcias, but didn't. I got some lithium batteries at another stop and then checked out Sierra Trading Post for the first time. Not sure what the fuss is about, but I did pick up a 14 ounce bivy that was open at the top, but otherwise waterproof. You can just cover the open part with your coat or something, I had been told in REI. They did have a shirt similar to my current favorite at almost as little as I paid for it, but it had a zippered pocket placed along the buttons which just makes the shirt look funny. They had no bear canisters. I got into Bishop far too late to get a canister from the Inyo ranger station there and couldn't find a map to locate the closest ranger station to my destination for getting a canister for $5 a week in the morning. I found a spot for the night and in the morning headed to the Lone Pine ranger station, which I drove right past and ended up at an Interagency Visitor Center instead. When they finally open at 8AM when I needed to be at the trail head, I find that here, they rent canisters for $2.50 per day, not $5 per week, and won't let me have one unless I can produce a permit number. I don't have the permit number, but they do manage to mention that I could get one in town from the sports or hardware stores. I do manage to find the ranger station on the way back into town, but it has been converted to an administrative unit only now. I end up finding a Garcia for slightly less at the hardware store, everyone else is either sorry they missed me and promising to be back half an hour ago or trying to rent me something smaller. Taking off up the road, I manage to navigate all the hairpin turns and the last bit with a low speed limit in just over half an hour, making me about 1 hour late to meeting the rest. The clouds are out already and they've been hearing rumors of rain that came in by lunch time and settled in for the remainder of the day the day before. It was a howling storm when they came up the hairpins the night before. They're worried about all this weather and have decided to get camp settled quickly. I ask a couple stretching at the trail who described the group perfectly... I'd missed them by about 20 minutes. I pack up the food quickly deciding I've gotten too much lunch, and get all the food and smelly, especially a bottle of conditioner that is exploding a little more each day, into the bear boxes by the lot. I add the tent footprint and two stakes to my bivy shelter. 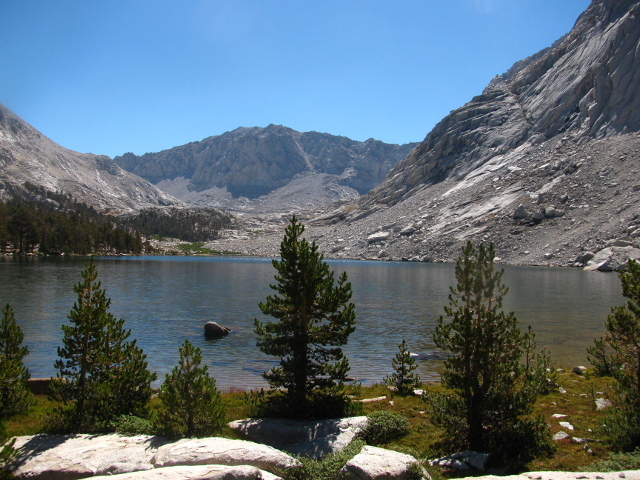 I can't seem to locate my GPS as I start, shoulder the pack, still a bit heavy but feeling like something I can handle, and start off up the trail knowing only that today we camp at "Cottonwood Lakes" and tomorrow we go over New Army Pass as a means of finding the group. 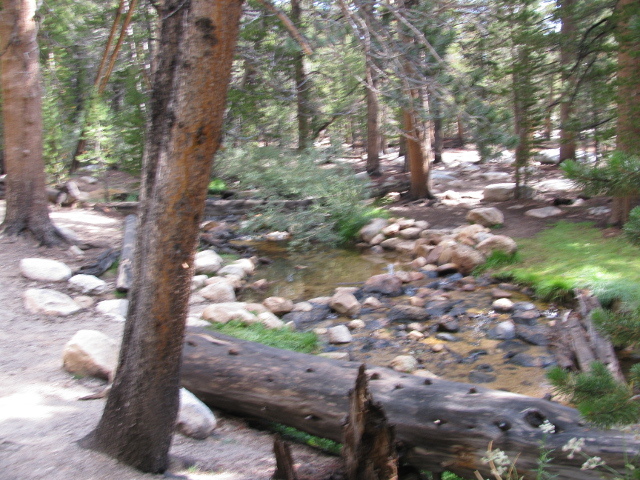 Not too far down the trail, I come to the side of some water that is Cottonwood Creek. The trail makes its way pleasantly through trees. It comes to Cottonwood Creek and crosses. There are meadows along the way, most of which are roped off. There is a lot of traffic, so perhaps they feel the need to discourage those up for picnics from overusing these areas. Breaks through the trees show a bit of granite here and there, but it is mostly forest. Gradually, as I climb, the forest changes character. 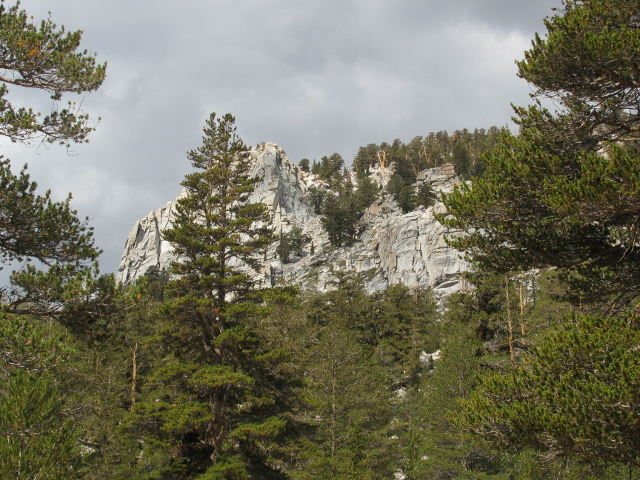 A granite cliff face emerging from the trees. The forest at the top is distinctly different from the trees around me. And the clouds are threatening. I found a nice loop to go on, estimated it to be at least 17 miles, and found the trail to make it a nice smaller loop to go on instead. 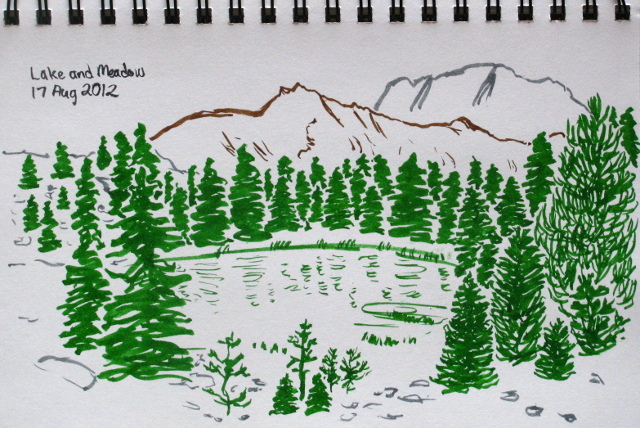 This one had seemed small, so I added in an excursion to a couple lakes at the side. And then I battled a printer far too long to get a map out of it and got to bed far too late before starting the hike the next day at Bucks Summit where the Pacific Crest Trail crosses Bucks Lake Road. I found the trail marked "closed" due to the fire north of the wilderness and across a large river canyon. At the top of the trail post was a copy of the forest order closing the trail. I found that it only applied to places north of highway 70 while I was south of it and wouldn't be going near it. 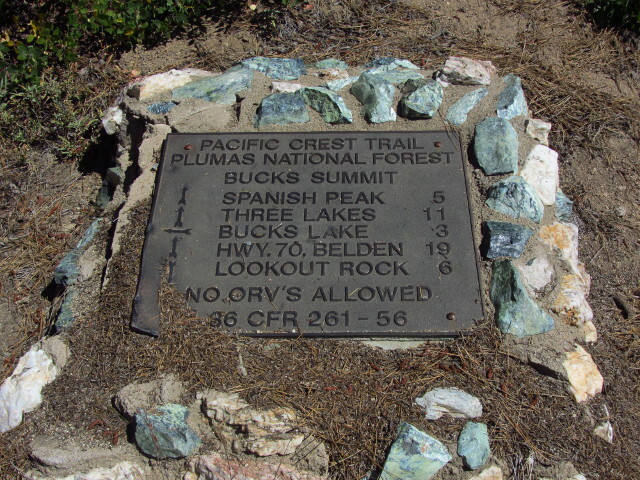 Sign at the trailhead, which is only the summit in the sense that it is the high point of the road. As I decided to ignore the "closed" signs that were clearly overstating it a little, a ranger drove up to be sure the signs were being informative and current enough. After talking all around it I managed to establish that the posted order was the current one and I hadn't misinterpreted it, but that a new order to close the trail was getting the once over by lawyers and once it was posted, I could be cited for disobeying it. The problem was not any personal danger I would be in entering the area due to the fire, but the difficulty in handling through hikers bumping out at Belden along the highway. I was just an unfortunate side effect. She even suggested that I should take my return route instead, which I thought was odd since that puts me in the same area and should be just as bad as going up this way if it was bad at all. Having established that it might be a grey area for me to head up the trail, but there was no danger due to the fire there so no reason to prevent me from going, I turned again and started up the trail. Indian paintbrush was well represented along the trail, especially in the lower areas. 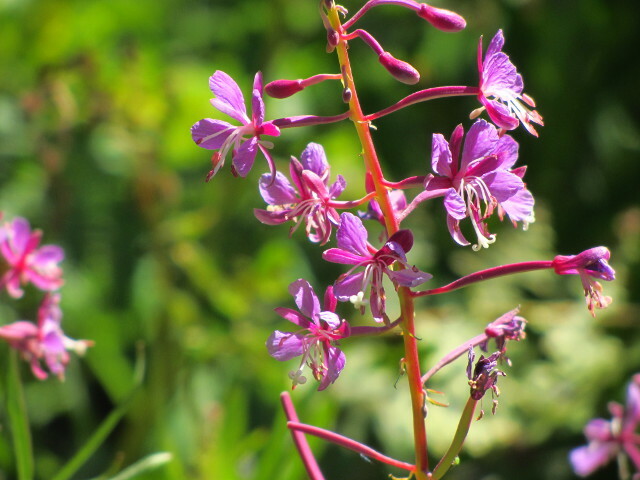 These are some more abundant, more delicate looking, flowers.